An individual should set a goal of setting aside an amount for savings each month, but should try to increase that amount at every available opportunity. It is a common notion that bigger income is a straight way to becoming a millionaire, but it is simply not true for a country like India, where inflation grows at rate higher than the paychecks. Clearly, getting more income does not mean more savings as many underestimate the power of controlling expenses. A person with an annual income of Rs. 5 lakh could have more savings than a person with an annual income of Rs. 10 lakhs, simply through following an efficient savings and expenditure plan. So, here are the five habits that could put you on your way to become a millionaire. An individual should set a goal of setting aside an amount for savings each month, but should try to increase that amount at every available opportunity. For example, if savings goal is to set apart Rs. 5,000 each month then try to increase it to Rs. 6,000 or Rs. 7,000 each month. More savings are better but take care you don't go overboard. Most of the savings disappear in little squandering that go unnoticed. For example, more eatouts in a month or surprise shopping. Sit and track your spending to know where you have gone wrong. Awareness about your finances creates responsible spending behavior and so tracking and budgeting might help you get over the urge of being extravagant. 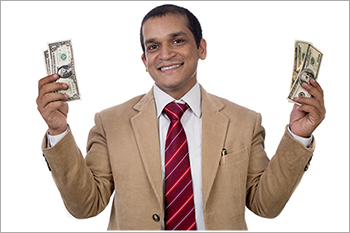 People have psychology that a raise in their salaries is sure shot way to more savings. But have you ever given thought to some of the spending that are completely unnecessary. If you jot down details, you could surely get some thousands being spent away here and there, which if saved qualifies as good as a raise. Living a simple life, like when we lived during out college years, is best way to amass huge savings during the early stages of life that will eventually grow at a compound rate over the next several years. Experts believe that once a person starts buying luxuries, it will be harder for them to go back the ‘simple’ way. Avoid the illusion of good things happening in others’ lives as every individual has a different financial health. It is important to concentrate on what you have and where you want to go rather than competing with those around. Build your own goals and stick to it to see an everlasting result that it will have on your finances.